One of my favorite places for small living inspiration is Ikea Hackers. If you’re unfamiliar with the site, it’s a collection of reader-submitted modifications to pieces of furniture from Ikea. The hacks range from relatively small (like adding paint to a Lack table) to extremely involved (like turning a Spar butcher block into an electric guitar). The site has been around since 2006 and is teeming with ways to personalize Ikea furniture. The rolling bookcases not only hold her clothes, but also her hobby supplies (such as the sewing machine and fabric stash pictured above) and other necessities for her apartment. I like that she can roll the sewing Expedit directly to her sewing table, and then roll it all back into the closet when she’s done. The storage system is ideal for this small space, and I think could easily be utilized in other homes — small or large. Note: There are casters that are specifically made to hold the Expedit bookcase, but they stick out beyond the base of the bookshelf, so you can’t nest the shelves directly next to each other. They’re also $5 more for two casters, which adds $50 to the cost of casters, but gets rid of the need to attach a piece of wood to the bottom of each bookcase. If you don’t need the items to nest next to each other, the Expedit casters might be a good alternative for you. If you are unfamiliar with Ikea Hackers, spend some time perusing it for even more ideas. Most of the hacks are inexpensive and easy to do. Images by Regina as posted to IkeaHackers, and thanks to reader Shalin for bringing this closet to our attention. Before you pack away your winter coat and hat, take a few minutes and make sure you’re keeping clutter out of storage and also protecting your clothes so you won’t be unpacking clutter in the fall. The Reel Roaster is guaranteed to make any child a plaintiff in a personal injury class action suit. In our recent move to a smaller home, we have noticed that our daughter’s highchair is in the way more often than not. For good or bad, people make assumptions about you based on the appearance of your office. If they see a framed picture on your desk of you standing on a beach with two children, they instantly assume you like going to the beach on vacation, you have two kids, and you enjoy being reminded of this vacation while you’re at work. If you have a law school diploma and a state bar association certificate framed and hanging on your office walls, people seeing these items assume you’re a lawyer, who graduated from a specific school, who is legal to practice law in your state. The previously mentioned examples of the family photo and the diploma both resulted in positive assumptions about you and these items were likely placed in the office to elicit the exact responses they received. The bad side of assumptions based solely on appearances is that people can also come to negative conclusions about you. For example, a consistently messy desk (not one that is disrupted for a few hours each day as you plow through a project, but one that is disorganized, dirty, and cluttered over a prolonged period of time) can hurt you professionally because it gives the impression to your coworkers you’re not a good employee, even if your work product proves otherwise. … according to a survey of U.S. workers by hiring firm Adecco, 57 percent of people have judged a co-worker based on the state of his or her workspace. A clean desk sends the message that you’re organized and accomplished, while a disheveled one implies that the rest of your life is in a similar state. Trezise says that a little mess is OK, but that “the problem comes in when it affects other people. Can you do your job? Maintain relationships with colleagues?” If the answer is no, you might need to rethink your habits. To keep your coworkers from making negative, and probably inaccurate, judgments about your job performance, spend five to ten minutes each day cleaning and straightening your workspace before heading home. Return dirty dishes to the break room, wipe up any spills, process the papers in your inbox, throw away trash, put away current projects to their active file boxes, and set your desk so it is ready for you to work from it immediately when you arrive to your office the next morning. Not only will these simple steps send a positive message to your coworkers, but they will also help you to be more productive. For larger projects, such as waist-high stacks of papers and towers of boxes cluttering up your office, schedule 30 minutes each day to chip away at these piles. Your coworkers will notice your efforts and start to reassess their negative assumptions. For the rare few of you who work for bosses who believe a messy desk is proof of your competency, I recommend keeping a fake stack of papers on your desk for the purpose of looking disorganized. To create your fake mess: assemble five inches of papers from the office recycling bin and wrap a large rubber band around the stack. The bundling will make the stack of papers simple to pull out of a drawer when you need it to influence your boss, and it will also make sure you don’t get any important papers mixed in with the decoy stack. Think of the stack of papers similar to a potted plant (which, oddly enough, researchers have discovered gives the impression to your coworkers that you’re a team player, so put a single plant in your office if you don’t already have one). Like most of you, I don’t love that assumptions about job performance are influenced by the appearance of one’s office, but feelings about assumptions aren’t important. If you want a promotion and/or raise, if you want your coworkers and boss to have positive opinions about your work, and you want to give the accurate impression that you value your job and place of employment, then keeping your office organized and clean can’t hurt you in your pursuit of these goals. My opinion is that in this economy you do what you can to keep a job you love, so it’s a good idea to spend the five or ten minutes each day helping yourself in a positive way. 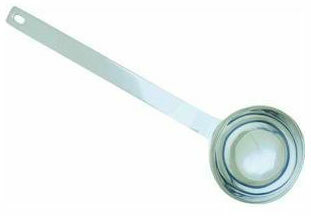 It’s difficult to believe, but it appears we have run out of coffee unitaskers to feature. Instead of giving up and throwing in the towel, reader Elaine found us a brilliant “multi-tasking” unitasker from Italy to feature instead. … [to] take advantage of the usual cross-legged position to become a comfortable surface useful for consumption of a meal outdoors. 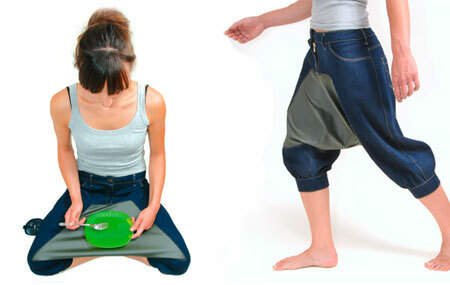 Laterally pants have an orientable pocket for drinks. I’ll be honest, the drink holder on the right knee has the potential to be useful. However, since it’s not detachable, it’s awkward just hanging down when you’re up walking around. The tray insert between the legs, though, is wrong on many levels. My biggest issue with it is that the tray prevents crumbs from falling directly to the ground. Not having to clean your clothes or the floor when you’re finished eating is why eating outside is so awesome. You dropped a bit of your hot dog bun onto the grass? No problem. A bird will come along and eat that bun piece for dinner — simplicity to the extreme! Thanks again to reader Elaine for finding this week’s unitasker for us. Reader Jesse asks for tips on how to store sporting equipment. The best ways to store out-of-season clothing in your home. This week is the first National Severe Weather Preparedness Week in the United States. The National Oceanic and Atmospheric Administration, along with a number of other acronym-identified organizations, started the week to help Americans prepare for floods, tornadoes, hurricanes, major thunderstorms, earthquakes, volcanoes, wildfires, and whatever else nature throws our way. The first bit of advice they give is to identify what types of severe weather and natural disasters regularly affect your area. USA Today has a nice interactive map that lights up when you select the specific disaster. It’s not a perfect map — it doesn’t identify the Mid-Atlantic as having earthquakes or tornadoes, yet we had both in 2011 — but it’s decent for identifying the most likely disasters to hit a state. Their second suggestion is to create a disaster kit and an emergency plan based on the disasters that are most likely to strike where you work and live. If you haven’t organized a kit or a plan, check out FEMA’s articles on how to build a disaster kit (they also have a flier with similar information) and how to make a plan to meet up with your family after a disaster strikes. They also recommend getting a NOAA Weather Radio. 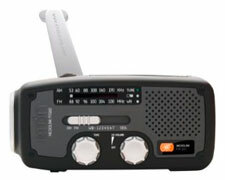 I noticed recently we didn’t have a single radio in our house, so I ordered one of these for our home. There are many different styles, I liked this one because in addition to batteries it has a crank and a solar panel for alternative energy sources. The article doesn’t mention this, but it’s also a good idea to have an emergency kit in your car. The kits are small, easily fit into the trunk of your car, and can be life-saving in an emergency. If you don’t want to assemble one on your own, there are numerous kits available for purchase. With all emergency kits, it is important to maintain them and check them twice a year. If you already have kits, National Severe Weather Preparedness Week is a good time to go through them and make sure all parts are present, in good condition, and nothing has expired. Even though they’re not fancy, emergency kits are extremely useful gifts for graduating seniors. It’s the smallest of improvements that often make the biggest difference in my life. For example, Hallmark made mailing cards significantly easier in February with the release of their postage-paid envelopes. Hallmark Postage-Paid Greetings feature the U.S. Postal Service’s Intelligent Mail barcode on the front of the envelope. When the cards are processed at a Postal Service facility, the barcode automatically indicates to the Postal Service the postage is paid. The postage is treated like a Forever stamp, and its value will always be equal to the price of a standard First-Class stamp, regardless of when it’s mailed. In the article “Birthday cards and reminder systems” from back in 2007, I wrote about how I buy all my cards for the year at a single time to be more efficient. I’ve also been buying enough Forever stamps to cover all the postage for those cards around the same time. These new pre-paid envelopes make it so I don’t have to worry about the second step in the process. Also, it saves time if I need to pick up a last-minute card at the store — I just sign the card and drop it into any mailbox without having to go to the post office (which, since I haven’t yet bought my supply of cards for the year, I’ve actually done twice in the last week). Hallmark saves me from having to run another errand, and I like not having to run errands. These new envelopes might not be for everyone, especially if you never mail cards, but for someone like me who sends a lot of cards they’re extremely convenient. What small improvements have made a big difference in your life recently? Share your finds in the comments. 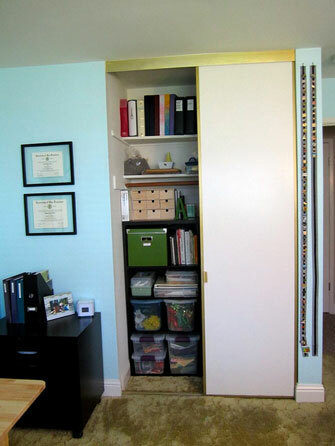 This storage closet in a craft room is beautiful. Scrapbooks and photo albums are all on the top shelf, crafting materials are in clear tubs (so the user can easily see what is inside without having to open the boxes), and even the craft books have a dedicated shelf for storage. By simply adding a shelving unit beneath the clothing rod, the closet went from nearly useless storage for a craft room into perfect storage for a craft room. One of my favorite aspects of this office is the pin collection displayed to the right of the closet doors. I don’t know if they’re District pins for a community service organization or Disney collector pins or what exact type of pins they are, but the hanging strip of them is brilliant. They’re decorating a wall that otherwise wouldn’t be used for anything, and they’re displaying what is a valued item (instead of having it stuffed in a drawer). If you wear brooches or tie pins, this also would be a great way to store them. The craft area in the room is nicely done, too. 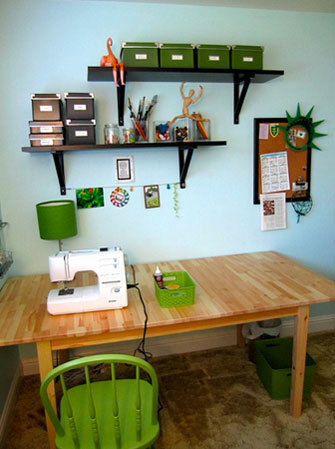 All the supplies are well contained, there is a fun apple green accent color running through the space, and the work table is nice and big to use for lots of different projects. Thank you, All Those Details, for sharing your workspace with us. The purpose of the Uppleva is to get rid of the cable mess and lack of visual uniformity that often comes with televisions and components today. The cabinet also can be configured to include additional space for more components, like a digital cable box. And, it comes with a universal remote. The new television has been referred to as “groundbreaking” and an “amazing all-in-one television” since the announcement, but I’m going to shy away from both of those phrases. To me, it’s simply the reintroduction of the console television with modern components. It’s attractive and effectively hides all the cable mess and visual distractions. It’s certainly an uncluttered entertainment center and it’s nice to see companies creating streamlined products. According to Reuters, the system will be “in five European cities in June, throughout seven European countries this autumn, and in its remaining markets [such as the USA] in the summer of 2013.” The electronics were designed specifically for Ikea by China’s TCL Multimedia Technology Holdings (they create the brands TCL, ROWA, Thomson, and RCA). Prices for the Uppleva system have not yet been announced. What do you think of the Uppleva? For this week’s unitasker selection, I wanted to keep with the April theme of coffee-inspired unitaskers. And, when looking for such unitaskers, my kitchen seemed like the perfect location to find candidates. I may talk the talk and walk the walk in other areas of my life, but not where coffee is concerned. Let me illustrate my point: I use the Aerobie AeroPress coffee and espresso maker with a tiny filter to make my coffee. It requires ground beans, which I grind in my Capresso Infinity Conical Burr Grinder, and hot water, which I heat in the microwave or in my teapot. Except for the mug and a splash of milk, this is the entirety of my coffee-making needs. But is this where my coffee gadgets and doodads stop? Oh no. Since I pour my coffee beans straight from the bag into the top of the coffee grinder and my coffee grinder only grinds the specific amount of beans you set it to grind, I don’t use a coffee scoop. Additionally, if I did need to measure ground coffee, I would just use a measuring spoon (one cup of coffee requires two tablespoons of ground beans in the AeroPress). This space hog was our primary coffee maker until it died in 2009 and we bought the AeroPress. We found out, however, that it could be resurrected for very little money, so we had it fixed. The reason we keep it is because it’s great at parties where everyone can choose the exact type of espresso they want and get a customized drink in seconds. (In contrast, it’s difficult to make enough coffee for a group of people with the AeroPress quickly.) But, since becoming parents in 2009, we have only thrown one party where people have used it. One. We might use it more regularly to make a quick cup for ourselves if it didn’t require ordering special coffee pods from the manufacturer to use in the machine. It’s not like the Keurig machines that have pods available at the grocery store or at Costco. We have to plan a week in advance to get a fresh cup. 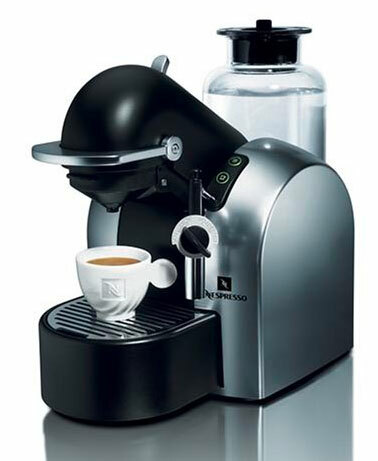 Keeping it and not using it is ridiculous since our exact Nespresso model is no longer in production and its value has soared. They sell on eBay and Craigslist for significantly more than what we spent on the machine. We would actually make money if we sold it. I need to sell it. I do. Do you have coffee unitaskers taking up residence in your home? Are you harboring items you never use? Is there a coffee machine on your countertop that you haven’t touched except for once since 2009? No? Just me? How can I possibly display and store such varied sentimental items in a one-bedroom apartment without looking like a junk shop? Help!! Chalkboards to keep you on track with your goals. How to print to PDF without having to drop hundreds of dollars on Adobe Acrobat 8 Professional.